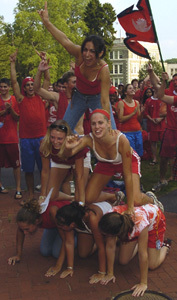 It is arguably Haverford's oldest tradition and it's not the Honor Code. Customs, an entirely student-run orientation program, seeks to provide the support and resources that many first-year students need to make a smooth transition from high school to college life. The orientation program continues after the initial“Customs Week” activities as a yearlong program supporting the incoming class as they adjust to life at Haverford. This year's orientation for first-year students began August 25. New this year, the Customs Week committee was formed to focus on all of the activities that occur during the first week freshmen are on campus. In his 19 years at Haverford, Watter has seen Customs evolve into a coordinated effort to work toward a common goal. Overall, there are approximately 180-200 students, all are volunteers, involved in welcoming the first year students, Watter says. “I got involved in Customs because I had such a positive experience as a freshman,” says Beth Copeland '06, Customs Week co-head.“It's incredible to be the first face freshmen see on campus.” Customs activities range from social activities like Dorm Olympics and dances with Bryn Mawr College to serious discussions about the Honor Code and diversity on campus. Students involved in Customs also serve as“troubleshooters” for freshman explains Stephanie Carnes '06, Customs Person Committee co-head. Customs people serve as a resource for students and really help them adjust to Haverford, Carnes said. After her customs group participated in a“trust walk,” Marisa Militello '08 said the activities during Customs Week have really helped form new friendships. “The activities we participated in during Customs Week have made each of us feel incredibly close to a group of people who we've known for only a few days," says Militello. Halli Melnitsky '08 said Customs has already helped her feel more comfortable at Haverford.